After proving that she probably would be a justice like Sandra Day O’Connor, Harriett Miers has thrown in the towel. While we held out hope that she would be a justice like Thomas or Scalia, it became less likely as the hearings were drawing near that this was the case. The more we learned about Miers, the murkier her core values became. She appears to be just another antinomian evangelical merrily going through life. Miers gave us a break by stopping this train wreck before it went off the bridge. The real question is will President Bush give his supporters a real constitutional conservative that they can rally around or will he give us another pick like his father did? 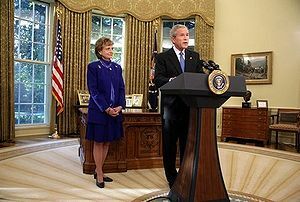 It has been truly amazing how timid that President Bush has been on domestic issues. Perhaps the President will realize that the Democrats don’t want peaceful coexistence but to eradicate all conservative Republicans starting with him. Bush needs to get a spine and lead by example, not capitulate to his enemies. They want his head on the impeachment spear before the next election. How this man can so compartmentalize his mind that the Global War on Terror is just but domestic enemies are to be appeased and not defeated is truly a marvel. He took an oath to defend us from all enemies foreign and domestic. If he would secure the borders, appoint the judges that he promised and reign in the spending of Congress he could elevate himself as one of the best Presidents in our history. I hope that the President will step-up and take advantage of this opportunity. In the movie City Slickers, Billie Crystal’s line was Life is a do over; for President Bush, so is this chapter in his administration.